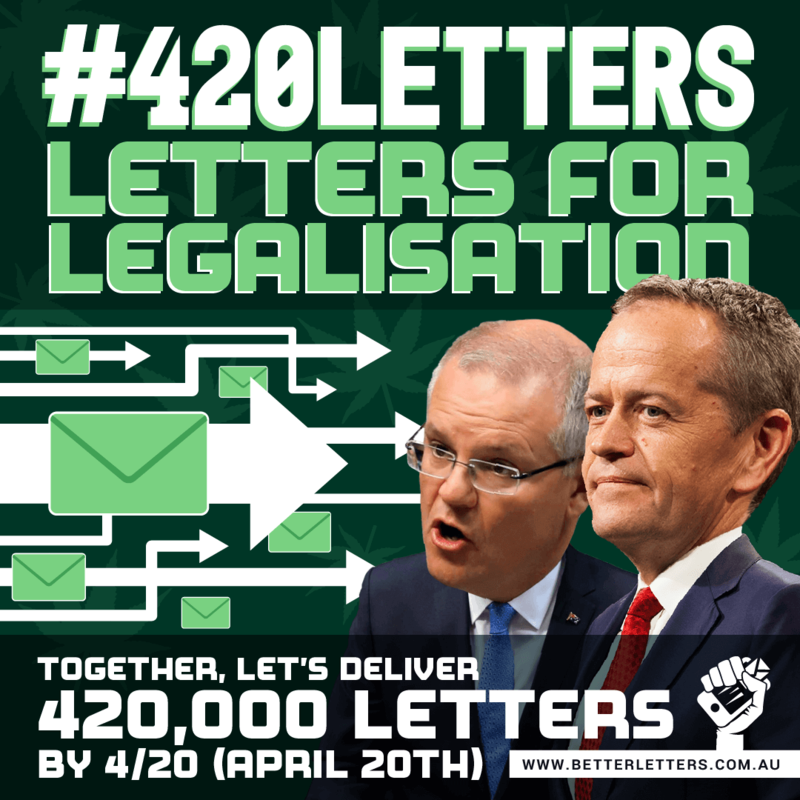 Better Letters and Friendly Aussie Buds have officially joined forces in the ‘Letters For Legalisation‘ campaign! We’ll be working together to achieve our collective goal of flooding the Federal House and Senate with 420,000 letters before the 20th of April, 2019. Our representatives won’t know what hit them! Really, though – just consider the possibilities, if we actually manage to achieve this feat! We will have ensured that as an electorate, our voice has been heard loud and clear right before the next federal election campaign gets underway. Regular Australians are readily capable of causing an unprecedented shift in public policy within the next assembly of parliament, if we push this issue hard. We just need to make politicians aware of their constituents’ priorities, and hold them accountable to the question of cannabis legalisation. One of the best ways to do this is by sending a letter directly to their mailboxes. That way, they’ll know exactly how you feel. For this campaign to succeed, we need your help. You can join in this effort by visiting the Better Letters website and sending some petitions. There, you can select from a comprehensive list of Senators and House MP’s. There are also plenty of templates to choose from – or you can write your own message, if you prefer. Once you’re done, the Better Letters team can send these letters off for you (for a small fee). Alternatively, you can print them out as PDF’s and send them yourself! To Whom Should You Write? Well, the most obvious answer to this question is your local House MP. You can find your electorate and view your Member’s voting record by using the ‘They Vote For You’ tool. With that being said, your representatives in the Senate deserve to receive some letters, too. Who those people are will depend upon the state you live in. Scroll down for more information on Senators and key House MP’s – the most important ones will be marked in bold. Of course, there are some household names out there that deserve a mention, like Prime Minister Scott Morrison (Member for Cook, NSW) and Opposition Leader Bill Shorten (Member for Maribyrnong, VIC). Both of these major party leaders have signalled their reluctance to modify or review the laws pertaining to cannabis use in Australia. Seeing as neither of these blokes seemingly possesses a spine, and one of them will indubitably emerge as the leader of this country for the next three years, it’s important that we assert our position on the matter to secure law reform on a federal level. Senator (The Hon) Ian Macdonald, Liberal Party: Chair of the ‘Joint Standing Committee on Foreign Affairs, Defence and Trade’, as well as Chair of the ‘Legal and Constitutional Affairs Legislation Committee’. This guy has already released several statements on his website encouraging the Government to set up a singular regulatory body for the legal distribution of medicinal cannabis. Be sure to pressure him for an answer on recreational cannabis! Senator (The Hon) Matthew Canavan, Nationals: Part of the Government’s ‘cabinet’, and Minister for Resources and Northern Australia. You could let him know about how cannabis prohibition affects many people in outback communities. Senator Chris Ketter, Australian Labor Party: Also the Deputy Opposition Whip in the Senate, and the Chair of the ‘Economics References Committee’. He voted very strongly to increase access to medicinal cannabis in 2017. Persuade him to whip his own party into shape! Senator Larissa Waters, The Greens: Already in favour of federal legalisation of recreational weed! You beauty. Send her a letter in support. Senator Fraser Anning, Independent: Recently came under fire for his deplorable comments after the Christchurch terror attack, and for assaulting a teenager who egged him in the middle of a press conference the next day. Why not send him a nicely worded letter? Senator Pauline Hanson, One Nation: Former fish and chip shop owner and full time xenophobe. Quote: “If they get away with censuring Fraser Anning, who is the next one? Me?” Hopefully. In the meantime, Pauline, try voting the right way on this issue. You were strongly in favour of an amnesty for medicinal cannabis users, back in 2017; calling yourself an ‘advocate’. Take the next step! Senator Anthony Chisholm, Australian Labor Party: He’s the Deputy Chair of the ‘Parliamentary Joint Committee on Corporations and Financial Services’, as well as the Deputy Chair of a ‘Select Committee into Fair Dinkum Power’. Voted in favour of increasing access to medicinal cannabis. Get him on board with recreational weed! Senator (The Hon) James McGrath, Liberal Party: Also the Chair of Joint Standing Committee on Electoral Matters. Was very strongly against increasing access to medicinal cannabis, when he voted it down. Give him a piece of your mind! Senator Barry O’Sullivan, Nationals: Chair of the ‘Rural and Regional Affairs and Transport Legislation Committee’. Senator Amanda Stoker, Liberal Party: Is the Chair of the ‘Parliamentary Joint Committee on the Australian Commission for Law Enforcement Integrity’. Senator Murray Watt, Australian Labor Party. Senator Claire Moore of the Australian Labor Party is retiring, and will not be standing for the next election. We are unsure of her replacement as of now. Graham Perrett MP, Australian Labor Party, Member for Moreton: Is the Opposition Whip in a Brisbane City seat. Could well be lobbied to publicise his position on legal recreational bud, and convince his other party members to do the same. Terri Butler MP, Australian Labor Party, Member for Griffith: Her inner-city seat (and her position on cannabis) are marginal enough for Terri to receive her fair share of letters. Trevor Evans MP, Liberal Party, Member for Brisbane: Holds a very marginal seat. If he even lasts this election, he could perhaps be persuaded to fold to progressive demands of law reform. Hon Bob Katter MP, Katter’s Australia Party, Member for Kennedy: This dude never ceases to amaze in how predictably unpredictable he is. Send him a letter to see what might happen. Senator Jenny McAllister, Australian Labor Party: She’s the Deputy Opposition Whip in the Senate, the Chair of the ‘Finance and Public Administration References Committee’, and Deputy Chair of the ‘Finance and Public Administration Legislation Committee’. Voted in favour of increasing medicinal cannabis access a couple of years ago. Send her a letter and persuade her to take the next step! Senator Deborah O’Neill, Australian Labor Party: The Manager of Opposition Business in the Senate, as well as the Chair of the Standing Committee of Privileges. She was in favour of increasing access to medicinal cannabis in 2017. Reach out and encourage her to take a stand! Senator Brian Burston, United Australia Party (Palmer): Formerly a sitting member of One Nation, who also happens to be sitting on the fence with cannabis. Send him a letter and let him know what’s what! Senator (The Hon) Concetta Fierravanti-Wells, Liberal Party: Voted against the legalisation of medicinal cannabis. Let her hear your voice! Senator Jim Molan AO, DSC, Liberal Party: This former major general can still learn to take better orders from the Australian people. Send a letter his way! Senator (The Hon) Arthur Sinodinos AO, Liberal Party: Has spoken in favour of grants being awarded for researchers in the field of medicinal cannabis. Have him be one of the first in his party to stand up on recreational weed! Senator (The Hon) Marise Payne, Liberal Party: Also the cabinet Minister for Foreign Affairs. Send a letter to her to have your voice heard! Senator Duncan Spender, Liberal Democrats: Recently assumed this seat in the space of David Leyonhjelm, who is contesting the NSW state election. He is in favour of legalising recreational cannabis. Senator Mehreen Faruqi, The Greens: Most likely to vote with her party in legalising recreational cannabis. Senator (The Hon) Kristina Keneally, Australian Labor Party. Labor Senator Doug Cameron and Nationals Senator John Williams are both retiring, and thus are not running in the next federal election. It’s currently unclear as to who will replace them. Hon Anthony Albanese MP, Australian Labor Party, Member for Grayndler: Albanese is a crowd favourite. As a senior member of Labor party and a vigil for the left of the party, his support for recreational legalisation would be huge. Hon Tony Burke MP, Australian Labor Party, Member for Watson: Is the ‘Manager for Opposition Business’. Give him a clue as to what the real business of an Opposition party *is*! Hon Tanya Plibersek MP, Australian Labor Party, Member for Sydney: Is the Deputy Leader of the Opposition. Sits in a precariously marginal seat. Get her on board with the new wave of cannabis legalisation, and watch her party follow! Hon Tony Abbott MP, Liberal Party, Member for Warringah: For the memes. Hon Barnaby Joyce MP, Nationals, Member for New England: Also for the memes. His office would look great with letters strewn everywhere. Will give him something else to fixate on, seeing as he is seeking so desperately to re-establish himself as leader of the Nationals. Senator (The Hon) Zed Seselja, Liberal Party: Admits in an interview that he’s never tried drugs, and is worried about the message that admissions of drug use from politicians could send to younger generations. Bombard this guy with letters! Senator David Smith, Australian Labor Party. Hon Dr Andrew Leigh MP, Australian Labor Party, Member for Fenner. Labor MP Gai Brodtmann has signalled her retirement as the Member for Canberra. Alicia Payne is likely to contest her seat. The new seat of Bean is being introduced this election, with no sitting MP as of yet. Senator Derryn Hinch, Justice Party: As a crossbencher, Derryn was key to passing an increased access of medicinal cannabis through the Senate back in 2017. Let him know that he should stand for legalising recreational cannabis if he plans on surviving the next election! Senator Jane Hume, Liberal Party: Is the Deputy Government Whip in the Senate. Made public comments citing the health risks of cannabis before Senator Leyonhjelm’s Bill in October of last year. Have a word with her! Senator James Paterson, Liberal Party: Is the Chair of the ‘Finance and Public Administration Legislation Committee’. Has never rebelled against his party. Voted strongly against an increased access to medicinal cannabis in 2017. Time to send this guy a message! Senator (The Hon) Scott Ryan, Liberal Party: Is the President of the Senate. Voted against an increased access to medicinal cannabis back in 2017, and is known for his strong opposition to recreational law reform. Flood his office with letters! Senator (The Hon) Kim Carr, Australian Labor Party: This Senator could be on the fence when it comes to the recreational legalisation of cannabis. Send him a letter today! Senator Raff Ciccone, Australian Labor Party: Another Senator who could potentially swing either way. Fill his letterbox! Senator Kimberley Kitching, Australian Labor Party: Voted in favour of medicinal cannabis access in 2017. Push her to commit to recreational legalisation in 2019! Senator Gavin Marshall, Australian Labor Party: Is the Chair of Education and Employment References Committee, among other things. Send a letter to educate him on the importance of cannabis legalisation to the Australian economy! Senator (The Hon) Mitch Fifield, Liberal Party: Mitch is the Manager of Government Business in the Senate, as well as the Minister for Communications and the Arts. Voted against an increase to medicinal cannabis access. Give him a rough breakdown on how cannabis enriches the artistic pursuits of Australians everywhere! Senator (The Hon) Bridget McKenzie, Nationals: Is the Minister of Minister for Regional Services, Sport and Local Government/Decentralisation. Voted strongly against medicinal cannabis. Let her hear your voice, Australia! Senator Janet Rice, The Greens: Is in favour of recreational cannabis legalisation on a federal level, much like her other comrades in The Greens (Such as Senator Di Natale, also hailing from Victoria…). Hon Greg Hunt MP, Liberal Party, Member for Flinders: Also the Minister for Health. Has spoken out against legalisation multiple times throughout his career. He is known for labelling the recent proposal by The Greens as ‘dangerous and medically irresponsible’. Send him a letter in response! Hon Mark Dreyfus QC, MP, Australian Labor Party, Member for Isaacs: As the Deputy Manager for Opposition Business, having Dreyfus on board would be a significant win. Hon Kevin Andrews MP, Liberal Party, Member for Menzies: Is the Chair of the ‘Joint Standing Committee on the National Disability Insurance Scheme’. Holds a solidly conservative viewpoint, but could be convinced to make concessions after having his seat targeted by GetUp! for the coming election. Senator Carol Brown, Australian Labor Party: Voted in favour of medicinal cannabis. Potentially on the fence for recreational legalisation. Be sure to send her a letter! Senator (The Hon) Eric Abetz, Liberal Party: Is the Chair of the ‘Foreign Affairs, Defence and Trade Legislation Committee’. Hardline conservative. Voted strongly against increasing access to medicinal cannabis. Send him a letter to make him aware of your voice! Senator (The Hon) Lisa Singh, Australian Labor Party: Publicised her strong support for medicinal cannabis back in 2015 during the Senate inquiry. Send a letter her way to encourage a further stand on recreational weed! Senator Anne Urquhart, Australian Labor Party: Is the Opposition Whip in the Senate. Send her a letter to whip her into action! Senator Catryna Bilyk, Australian Labor Party: Is the Chair of the ‘Standing Committee of Senators’ Interests’. Was absent on a vote for medicinal cannabis access. Let her know that it’s important to stand for recreational cannabis in the upcoming parliament! Senator (The Hon) Richard Colbeck, Liberal Party: Is the Assistant Minister for Agriculture and Water Resources. This guy could do with a nice letter. Senator Jonathon Duniam, Liberal Party: The Chair of the ‘Environment and Communications Legislation Committee’. Always votes with his party. Was against the changes to medicinal cannabis access in 2017. Let Jonathon know where you stand! Senator Nick McKim, The Greens: Would vote with his party in favour of the legalisation of recreational cannabis. Woohoo! Senator Peter Whish-Wilson, The Greens: Would also vote with his party on the recreational legalisation of cannabis. Yeehaw! Senator Helen Polley, Australian Labor Party: Is the Chair of the ‘Standing Committee for the Scrutiny of Bills’. Send her a letter to scrutinise! Senator Wendy Askew, Liberal Party. Andrew Wilkie MP, Independent, Member for Denison: Is in favour of medicinal cannabis for as long as it is ‘appropriately regulated’… so if that much is possible, send him a letter for full legalisation! Ross Hart MP, Australian Labor Party, Member for Bass: Ross is the Deputy Chair of the ‘Joint Standing Committee on Trade and Investment Growth’. Send him a letter persuading him on the benefits of recreational weed from a ‘trade and investment’ standpoint! Senator Patrick Dodson, Labor Party: Is the Chair of the ‘Joint Select Committee on Constitutional Recognition relating to Aboriginal and Torres Strait Islander Peoples’. Also voted for the legalisation of medicinal cannabis in 2017, and has spoken fondly of it in that time. This may be one of the Senators we can actually convince. Send this guy some letters, stat! Senator (The Hon) Michaelia Cash, Liberal Party: Minister for Small and Family Business, as well as Skills and Vocational Education. Was against increased access to medicinal cannabis in 2017. Send a letter to help her get in touch with the wants and needs of her constituency! Senator Louise Pratt, Australian Labor Party: The Chair of the Legal and Constitutional Affairs References Committee. Seeing as the Scheduling of cannabis exists within the criminal code, her support could prove influential in future decisions surrounding cannabis legalisation… assuming she maintains her role. Senator Sue Lines, Australian Labor Party: Is the Chair of Committees, and the Deputy President of the ‘Chair of Joint Standing Committee on the Parliamentary Library’. Fill her books with letters! Senator Slade Brockman, Liberal Party: Chair of the ‘Education and Employment Legislation Committee’. Send Slade some well-researched opinions, written on a piece of paper; who knows what might happen! Senator the Hon Mathias Cormann, Liberal Party: He is the Leader of the Government in the Senate, the Vice-President of the Executive Council, and the Minister for Finance and the Public Service. Oh, and he sounds like Arnie. Let Mathias become aware of the significant benefits legalisation would bring to Australia’s economy. Senator the Hon Linda Reynolds CSC, Liberal Party: Linda is the Minister for Defence Industry, as well as the Minister for Emergency Management and North Queensland Recovery. She deserves some of your love, too! Senator Rachel Siewert, The Greens: This woman is the Whip for The Australian Greens, and voted in the past to increase access to medicinal cannabis. Bless her! Senator Jordon Steele-John, The Greens: Another Greenie, another Senator in favour of legal recreational cannabis. Senator Dean Smith, Liberal Party: Is the Chief Government Whip in the Senate, and the Chair of the ‘Joint Committee of Public Accounts and Audits’. Whip him into shape with some physical letters today. Senator Glenn Sterle, Australian Labor Party: Chair of the ‘Rural and Regional Affairs and Transport References Committee’. Could likely be convinced to fall in favour of recreational cannabis on the Commonwealth level. Give him a try! Senator Peter Georgiou, One Nation: Not much to say about this guy, other than… send letters. Ian Goodenough MP, Liberal Party, Member for Moore: I know we’re asking for moore from you, mate… but as the Chair of the Parliamentary Joint Committee on Human Rights, is locking up non-violent drug offenders really ‘goodenough’ for your standards? Patrick Gorman MP, Australian Labor Party, Member for Perth: Another inner-city seat that we may have the potential to pressure for a positive outcome. Pile this guy’s office with petitions to get him on board! Senator (The Hon) Penny Wong, Australian Labor Party: A very important member of the Senate, as Opposition Leader in the Upper House. Was absent for the vote on medicinal cannabis. Is known to take a stand on issues of justice. If we lobby her to commit herself to the federal legalisation of cannabis, perhaps she will be sympathetic. Senator Alex Gallacher, Australian Labor Party: Chair of the ‘Foreign Affairs, Defence and Trade References Committee’. Voted strongly in favour of increasing legal access to medicinal cannabis patients. It’s possible that he could place internal pressure on the party to change their stance. Senator (The Hon) Simon Birmingham, Liberal Party: Is the Deputy Leader of the Government in the Senate, as well as the Minister for Trade, Tourism and Investment. Feel free to send this guy a letter on the economic benefits of recreational cannabis. Senator Tim Storer, Independent: As an independent Senator, he could push to make himself distinct against the major parties by supporting recreational cannabis. Be sure to give him some encouragement. Senator (The Hon) Don Farrell, Australian Labor Party: Is the Deputy Leader of the Opposition in the Senate. Could do with some attention in this campaign, as key members of the Labor party could make a massive difference in how the legalisation of recreational cannabis unfolds. Senator Sarah Hanson-Young, The Greens: Is already in favour of legalising cannabis recreationally on a federal level. Senator Lucy Gichuhi, Liberal Party: She’s the Chair of Community Affairs Legislation Committee. Australian cannabis legalisation is certainly a community affair… so, why not lobby her to support this move, even if she is a coldblooded Liberal? Senator (The Hon) Anne Ruston, Liberal Party: Voted against the medicinal cannabis bill. Would perhaps be appreciative of a letter bomb, to be reminded of where the community stands. Senator Stirling Griff, Centre Alliance: This guy voted against expanding access to medicinal cannabis in 2017… but everyone knows that true Centrists push to legalise recreational cannabis on a federal level. Heh. Senator Rex Patrick, Centre Alliance: Ditto. Send him letters! Senator (The Hon) David Fawcett, Liberal Party: Is the Assistant Minister for Defence. Could well listen to a stream of letters telling him what’s up. Hon Mark Butler MP, Australian Labor Party, Member for Port Adelaide: It may just be possible to convince him to support legalisation efforts. Steve Georganas MP, Australian Labor Party, Member for Hindmarsh: Is the Deputy Chair of the ‘Standing Committee on Health, Aged Care and Sport’. May be persuaded by arguments for recreational legalisation as a method of harm minimisation. Nick Champion MP, Australian Labor Party, Member for Wakefield: Is the Deputy Chair of the ‘Joint Standing Committee on Foreign Affairs, Defence and Trade’. May sit on the fence with this issue. A load of letters might just do it. Senator Malarndirri McCarthy, Australian Labor Party: Has vocalised her support for medicinal cannabis in the past. If she receives some letters on the topic of recreational cannabis, we may be able to shift her into becoming a supporter! Senator Nigel Scullion announced his retirement on the 26th of January 2019, and will not be running for the next election. 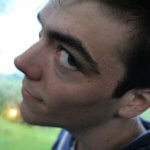 Sam MacMahon is expected to replace him on the ticket. Warren Snowdon MP, Australian Labor Party, Member for Lingiari: Is currently the Deputy Chair of the ‘Joint Standing Committee on Northern Australia’. Previously, as the Minister for Defence, Snowdon assisted in a crackdown on cannabis use in the Australian Defence Force. Send him a letter about prohibition and how it negatively impacts the communities he is meant to serve! Luke Gosling OAM, MP, Australian Labor Party, Member for Solomon. Recently, Senators David Leyonhjelm of the Liberal Democrats and Richard Di Natale from The Greens have both made moves towards legalising the use of cannabis for recreational purposes at the Commonwealth level. They have done so for largely different reasons and advocated for almost diametrically opposed approaches. Senator Leyonhjelm’s bill is in line with classical libertarian arguments, which suppose that adults should be free to make their own choices for as long as they do not harm others. He proposed the removal of existing barriers for cannabis legalisation on the federal level, without the imposition of an excise. This would leave the responsibility of imposing regulations for cannabis on the states and territories. Unfortunately, with the Coalition and Labor both opposed to legalising cannabis, the drafted amendments did not manage pass the upper house. Debate was adjourned before the laws could be voted on. On the other hand, The Greens’ bill is geared more towards harm reduction and minimisation. For Di Natale and his party, treating cannabis use as a ‘law and order’ issue, rather than a matter of health and wellbeing, has resulted in drug users gaining criminal records. This has deterred people from seeking help with drug-related problems when they need it most, and exposed many to the black market and other, more harmful drugs. Thus, the ‘War on Drugs’ is considered by The Greens to be an absolute failure. Any Greens member would vote in favour of cannabis legalisation on principle. Unlike Senator Leyonhjelm’s Bill, the market for cannabis would be highly regulated under The Greens’ bill. 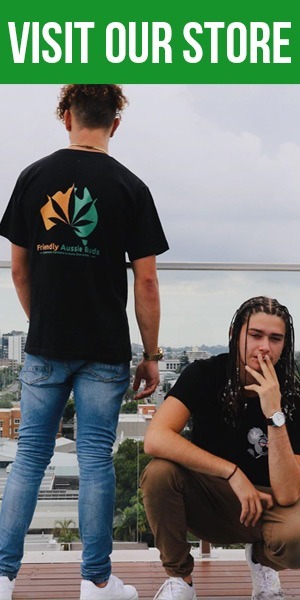 They have proposed the establishment of an Australian Cannabis Agency, which would be responsible for controlling both the market and tightly regulated licensed retailers. Their plan also calls for the plain packaging for cannabis products and a ban on their advertisement, the imposition of an excise on cannabis, and a requirement for ‘service of cannabis’ training, among other things. Find your local members, and send them a letter to the box. Cannabis may be illegal, but contacting your representative is not.